Boxing is a relatively inexpensive way to get highly effective exercise, and this well-known fact has continued to keep boxing in the spotlight and a prominent feature in the world of fitness. Read on to discover the beginners’ guide to boxing equipment courtesy of a team of professionals with a fierce passion for helping their clients reach their goals. If you’ve ever seen a Rocky montage, you would have noticed that all the equipment wasn’t particularly sophisticated. For the most part, all that was required was primarily a punching bag, a set of gloves and a skipping rope. This is particularly accurate for anyone who wants to begin boxing and is wondering what boxing equipment they should buy. Now before you run off to the nearest sports retailer in your eagerness to “float like a butterfly and sting like a bee”, let’s take a look at each of these boxing supplies. For both the seasoned trainee and novice, the convenience of a heavy bag is always a bonus. It allows you to put in the work at home, performing drill after drill without the need of a training partner. All that is required is that a decent pair of gloves protects your fists. When your technique improves, and your punches become more powerful, it’s best to opt for a heavier bag to avoid having the punching bag swinging too much. Now, not all boxing gloves are created equal. Boxing gloves will vary regarding quality depending on who manufactured them but also concerning their use case. Broadly speaking if you’re talking about boxing gloves that are used strictly for exercise then they can split into two categories, namely training and sparring. If you’re training with only your punching bag, then these are the gloves you need. Their design and finish will differ from those of sparring or competition gloves, but they will have enough padding to keep your hands from getting more beat up than the punching bag. The quality of the glove will determine how long the padding they provide lasts which is why it is always important to make the right investment for the health of your hands. Sparring gloves are designed to reduce the damage inflicted by each blow between you and your sparring partner. The end of the thumb is usually attached to the main glove, padding exceeds those in training gloves, and the shape is slightly different. Also, the weight balance is equally distributed from the knuckles to the wrist to ensure you are adequately supported from-punch-to-punch and the risk of injury is kept to a minimum. Keen to start your road to the ring? 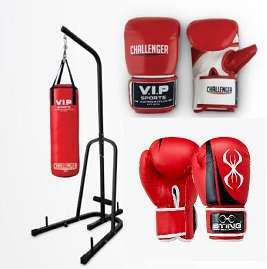 If you’re looking for a dependable supplier of quality boxing equipment at affordable prices that won’t break the bank, then Fitness Equipment Warehouse is your best bet. We have a comprehensive stock sourced from only the best brands. Whether you’re starting as a novice or looking to sharpen your skills as a pro, we have boxing supplies ideally suited for you.